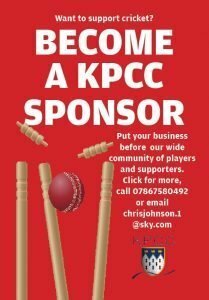 A chanceless century from Adam Sergeant helped to set up a convincing 56-run win for Knebworth Park at Kings Langley on Saturday in the Saracens Herts league Division One. It was a rare victory at the West Herts club which has rarely been a happy hunting ground for Knebworth. 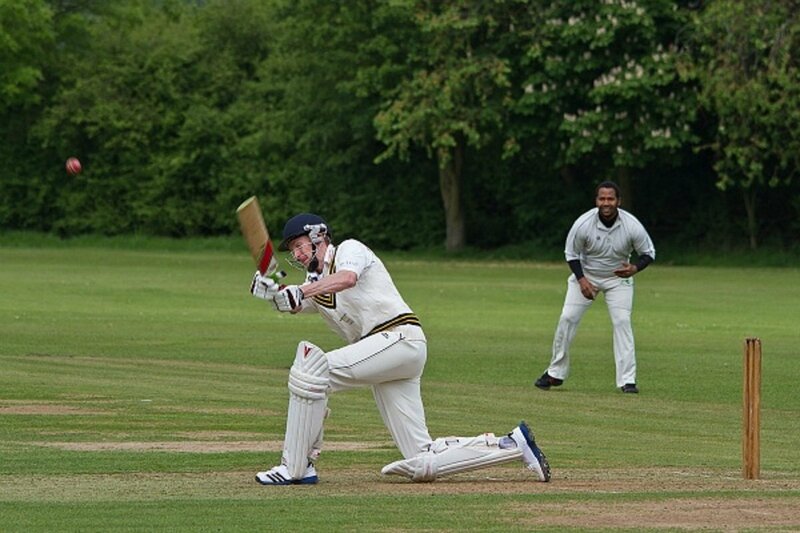 The Langley bowlers must be sick of the sight of Sergeant, pictured, as his 105 followed up the 84 not out which he hit in the previous fixture between the two clubs earlier in the season. Together with fellow opener Mo Asif (45), who batted with a broken finger for the best part of his innings, they remorselessly piled on 115 for the first wicket and from thereon the Park never looked back. Once they had departed there was no let-up as Ryan Skeggs (30) and Tariq Umair (35) rammed home the advantage in taking the total on to 233 for 4. In the final overs, Charlie Randall struck a sparkling 25 not out, to continue his good run of form with the bat. In the hunt for quick runs in the final overs, opening bowler Harry Sambrook picked up four wickets, finishing with 4 for 40, as Knebworth ended on 268 for 8. 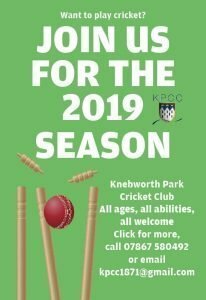 On a good flat wicket, Gareth Jones (2 for 61) gave Knebworth an early breakthrough before a run was scored by removing opener Scott Rolfe, while Sam McCrow with a mean 0- 32 in ten overs also put the home side behind the run rate. Simon Walker (39) and George Langston (43) sought to establish a platform but both were back in the pavilion before the score had reached 100. While Liberty Maher hit a well-made 53 before he was bowled by Jones, he found little support as the Park continued to keep a firm hand on the game. They all struggled against the bowling of skipper Guy Warman (3-42) and the off spin of Matt Hutchinson (4-35) together with Mo Asif’s accurate 0 for 32 throttling the Kings Langley run chase. From 70 for 1 off 18 overs their next 20 overs only managed to double the score in losing seven wickets. At 143 for 8 a heavy defeat was in prospect, but largely thanks to a defiant and spirited last wicket stand of 33 they lifted the total to 212 for 9. In a tight league table, it leaves seven clubs closely packed with the Park seventh, yet only 15 points off third place. The Seconds produced their best batting performance of the season in an exhilarating chase to stun Cheshunt. Jono Evetts’ side stumbled badly in their pursuit of 266 before the late middle order rallied superbly to guide them to victory. Alex Richmond struck an excellent 60 to put them back on track but there was still plenty of work to do for the eighth-wicket pair of Neils Hart and Sam Herron. However, they kept calm and a mixture of boundary blows, superb running and the generous gift of wides and byes sealed the win in the 49th over. Earlier, Cheshunt won the toss and elected for first use of another belting batting track while the rock hard outfield ensured full value for shots. They made steady progress before being checked by two quick wickets for medium-pacer Lewis Hutchinson. The visitors never built the big partnerships they needed and Alex Richmond claimed four wickets with a clever spell of off spin. A frustrating 32-run last-wicket stand lifted their score to 265 all out but it only looked just above par. In reply, the Park were in control at 105-1 but lost Evetts (49) and Ian Pickering (25) in quick succession, heralding a slump which reduced them to 138-5. At this point, Richmond took control, putting together partnerships with Hutchinson and Heron to restore the Park’s chances. But when he was caught behind aiming a big drive at a wide delivery with the score on 228 and seven runs an over needed, it was left to Heron (33 not out) and Hart (16 not out) to secure the 30 points. It was another tough day for the Thirds as they lost to in-form Watton at Stone. After electing to bat, park found life difficult on a tricky pitch as they quickly slumped to 29-3. No.3 Tom Hills was trying to hold the innings together but when he was ninth man out after a battling 37, Park’s total was just 115 runs before being dismissed in the 35th over. Watton flew out of the blocks in response trying to make short work of chasing the small total. An excellent spell of fast bowling from the returning Jack Forbes-Sobers gave Park their first wicket with the score on 50. Another wicket for Forbes-Sobers (2-25) and two for Ian Woods saw Watton fall to 61-4 and the Park began to think an unlikely win could be achievable. However with some more sensible batting, Watton began to edge closer and despite two more wickets for Woods (4-40) they reached their target in the 23rd over leaving Park thinking what might have been if they had an extra 30 runs to play with. The Fourths bowled well to restrict high-riding Stevenage V to 143 for 9, but they then found run-scoring difficult on the awkward batting surface and were dismissed for 76. Amelia Kemp (2 for 10), Bella Hopcraft (2 for 19) and Catherine Cirkel (3 for 39) were the most successful of the bowlers. In the Park reply, Catherine Cirkel (16), James Roos (12), Richard Wheeler (15) and Jonathan Cirkel (20) were the only ones to reach double figures.